Everybody loves a free trial. Customers love free trials because they can test out a solution before buying it or subscribing, reducing their risk. Marketing and sales teams believe they accelerate the sales process. The free trial is a favorite marketing and sales strategy for subscription-based businesses. Yet the free trial is more complex and subtle than either buyer or seller may realize. Many businesses suffer from common misconceptions that can lead to problems either converting the trial user to a customer or in the long-term customer relationship. Here are three common free trial myths that can hurt your business. What are people really testing during a free trial? If you asked them, they would probably say that they’re testing the service – the thing that they are paying for. That’s true, but not the whole truth. In reality, people are testing the experience of being your customer. What does it feel like? How are their interactions with your business? Can they trust you with their data, credit card, and time? Will being your customer make their life better? Reality: The free trial is a test of the experience of being a customer. Their experience isn’t always within your control. The person who signed up for a series of cycling classes might sprain an ankle, for example. Life happens. If the trial user has a problem and contacts support, what is that interaction like? If they cannot figure something out, how much time will they need to spend looking for help? If they wait three weeks to start the trial and then cannot find the login, what will they do? As much as you want to believe that everyone under the sun should be your customer, it’s not true. There is such a thing as a bad fit customer. Signing them up damages your business. They’ll realize their mistake and cancel soon or not renew at the first opportunity. Your business never recovers the cost of acquisition for this customer. They will try to make the solution fit, burning up your time and theirs on endless support calls and feature requests. They’ll be so unhappy that they feel betrayed and leave negative comments about your business on social media. Reality: Not every free trial user should become a customer. Sometimes the problem is a matter of timing. A prospect isn’t ready to become a customer yet. You don’t want to burn the bridge, but you may not want them to sign up right now. One of the most valuable roles of the free trial is determining the product fit. 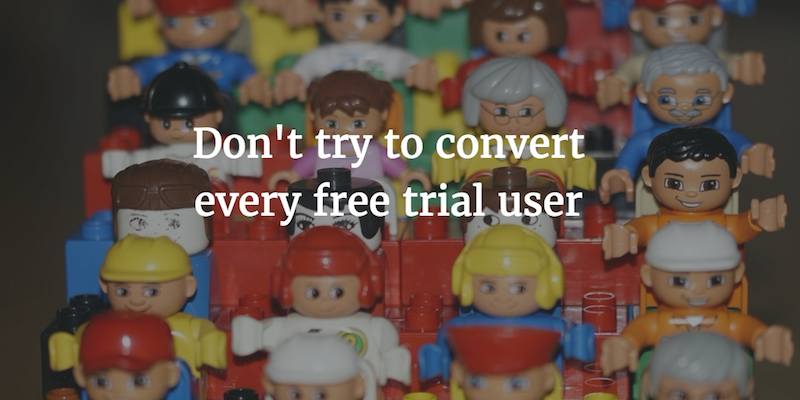 Make sure those customers find out and don’t try to sign them up automatically at the end of the trial. If you ask for a credit card up front, give them a chance to cancel before the trial concludes. You’ve invested a lot of effort into the thing you’re selling. You’re excited about it, as you should be. So, it’s easy to imagine that anyone who signs up for a free trial shares your excitement. Think about your own experience. Have you ever signed up for a free service or a trial because it sounded somewhat interesting, but then not followed through? Perhaps even forgot about it? I know I’m not the only one. Reality: Free trial users may need support, reminders, and encouragement. Your trial users may be interested, but not committed yet. They may have other things in their lives that are more important or urgent than trying your solution. But with reminders and assistance, you can get them started. Carefully craft your interactions with trial users to improve the experience, from the welcome email to support responses. Help and support the trial user with gentle reminders and useful content. 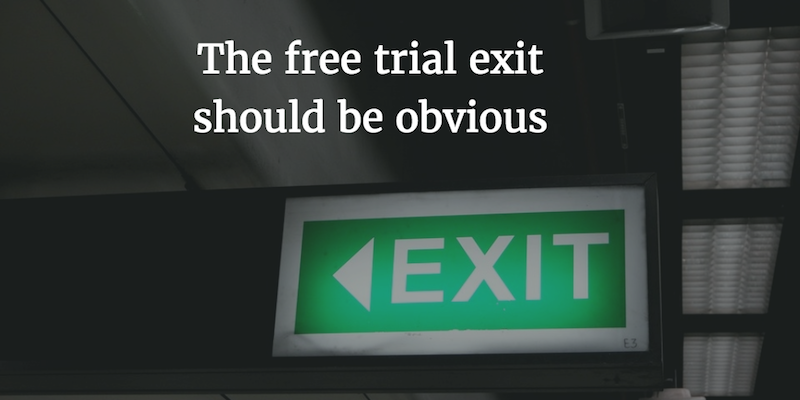 Give the trial user an easy opportunity to exit if they are not a good fit. For more on the free trial, see the second edition of Subscription Marketing: Strategies for Nurturing Customers in a World of Churn.